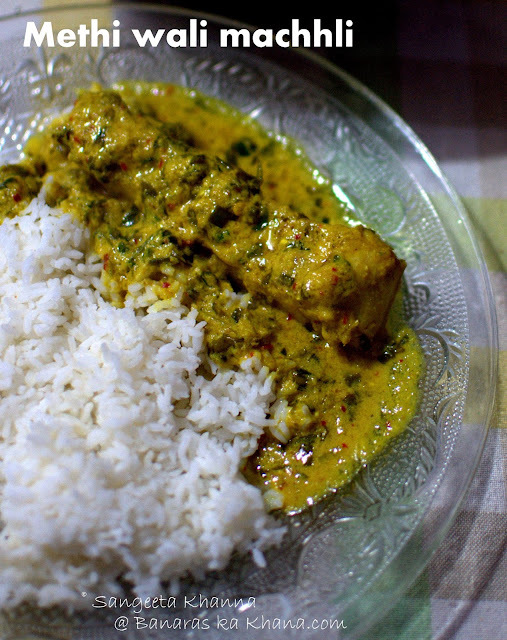 I have had methi wali machhli cooked by a friend's mother and had been planning to cook fish the same way since then. 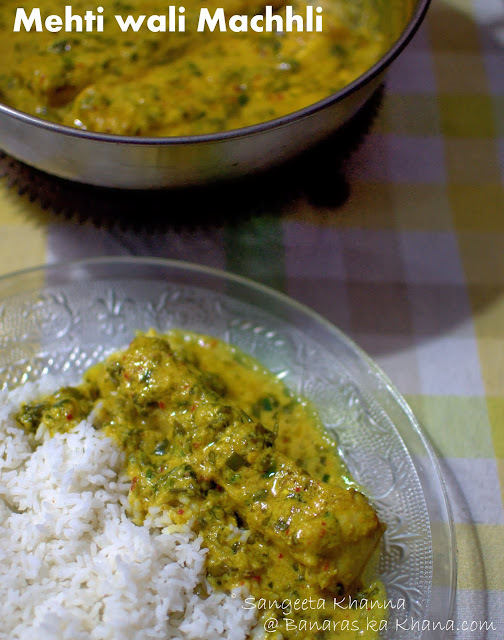 It is a mildly spiced fish curry in yogurt gravy and a lot of fresh fenugreek leaves. The fish suitable for this curry is large steaks with bones and skin and I decided to cook methi wali machhli as soon as I found good large fish steaks. This fish curry is similar to Machhli ka salan that doesn't use so much methi leaves o skips using them altogether. Most people cook this recipe with a lot of oil in it but my recipe doesn't have oil floating on top. You can use oil generously to get more glaze (or roghan) in this curry. Having fish at home has been an occasional treat lately, as we don't get good fish around our place. The skinned de-boned fillets don't count as fish which of course is available abundantly. I do cook some Basa sometimes but it doesn't feel like eating fish honestly. I want a fishy fish when I want fish, I know you understand what I mean. 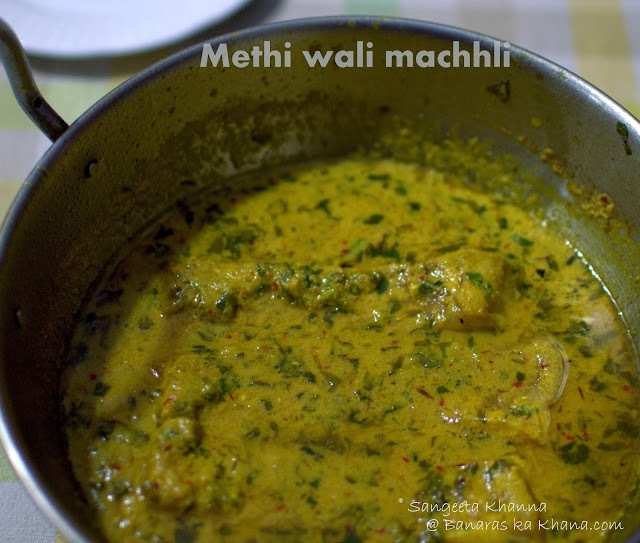 Although this methi wali machhli is not too fishy I must add. If you cook it with Basa fillet or large Pomfret fillets, it wont be even remotely fishy. We have a few nice fish markets in Delhi and we do get our fish from those places whenever we are around. We generally get a large Rohu or Catla or a Betki nicely cut into steaks to be frozen in portions and sometimes we get some Mackerel or Bombil which we cook the same day. The steaks I cooked in this curry were from the belly part but any bony steaks will be suitable, just take care the pieces should be sturdy enough to handle in a curry. This methi wali machhli is loosely based on a recipe I saw here but my recipe has fresh fenugreek leaves as the star ingredient, exactly the way I had loved it. This is a slightly tart curry as the curds I use for this is a little sour, the way I prefer it, the flavors of fenugreek complements really well with the tartness of curds (dahi). Make a paste of the onion, garlic, red chillies and 1/4 cup of yogurt along with coriander powder and turmeric powder. Add salt to it and dump this paste over the fish steaks in a mixing bowl. Add the chopped fenugreek leaves to this mixture, mix well and refrigerate for 2 hours. Blend the remaining 1/4 cup yogurt in the same mixie jar and keep aside. Heat mustard oil in a pan and add the fenugreek seeds in it. Wait till they become fragrant but take care not to brown them. drain the fish steaks form the marinade and fry in this hot oil both sides lightly. Drain and keep in a plate. In the remaining oil add all the marinade and bhuno till the oil separates. It takes about 4-5 minutes and the mixture get aromatic. As you see the oil separating form this cooking mixture, add the remaining yogurt, mix well and add about 1.5 cups of water. Let it come to a soft boil before adding the fried fish steaks. Cover and simmer for about 5-7 minutes or till the oil floats on top. These steak were large about 6 inches long with 2-3 long bones in it. The flesh acquires a nice yogurt and fenugreek taste while the gravy is absolutely yummy with all the flavors. I am planning to cook paneer exactly the same way next. Will let you know if I do. Better you cook and let me know if you are a vegetarian..
Paneer was just what I had on my mind as soon as I saw this recipe! Did you try the vegetarian version yet?